When your ability to work has been compromised to the extent that you are unable to work a full time job, you may qualify for disability benefits through Social Security. Social Security defines the situation where you would qualify as being unable to perform substantial, gainful employment in the national economy. “Substantial, gainful employment” is, in general, whether you are capable of working and earning more than approximately $1100 a month. If you believe you are within this abbreviated definition, you may qualify for Social Security benefits (there are more relevant factors, this is just an initial, brief overview). If so, you can file an application either online or at your local Social Security office. Pursuing benefits is one thing—but there's still a percentage of people out there who might not be aware that they qualify for social security disability. In addition to the criteria above, according to ssa.gov, you need to have worked in past positions covered by social security. The medical issue or issues that prevent you from performing substantial gainful employment must last or be expected to last for at least 12 months. At Blackwell & Associates, P.C. we can help you determine whether you qualify for benefits. We will also help assemble your medical records and reports to give you the best chance of winning at the hearing before an Administrative Law Judge, which is the next stage of the proceedings after a denial of the initial application. Since this is usually your one and only chance to tell your full story, personally, it is exceedingly important that you be represented by experienced counsel at that hearing. With the help of the team at Blackwell & Associates, P.C., you will receive prompt and complete representation in all facets of presenting your claim and we will work with you to provide you the best chance to get disability benefits. Call our team today for help at (636) 240-3632. Other Announcements, Events and Deals from Blackwell & Associates, P.C. 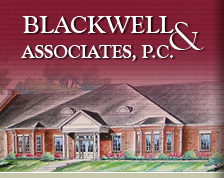 A. Blackwell & Associates, P.C.